Barbed wire remains in place at Pointe du Hoc, where U.S. Army Rangers scaled a 30-metre cliff to seize German artillery pieces. 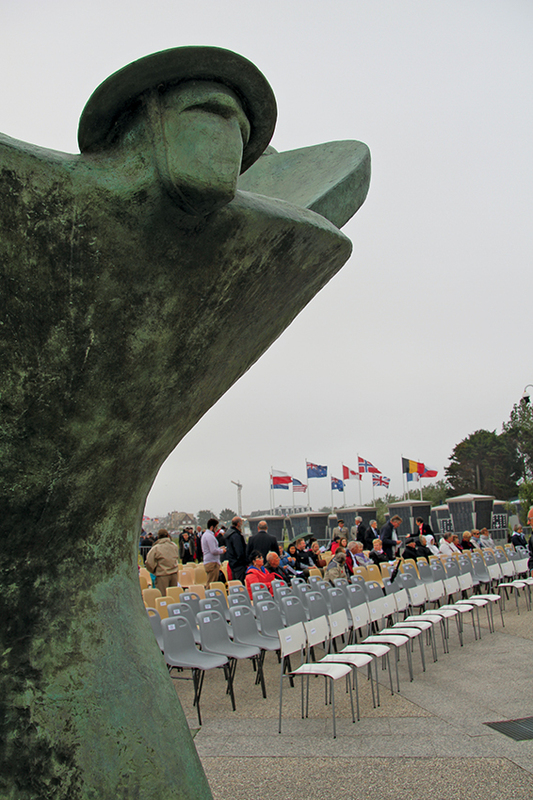 The sky is cloudy, but the rain holds off for this year’s commemorative ceremony at the Juno Beach Centre in Courseulles-sur-Mer, France, on June 6. The audience is filled with veterans and their families, currently serving military, officials and dignitaries, and a new, younger generation—all here to reflect and remember. The day marks the 74th anniversary of D-Day, the Allied invasion of Normandy, when a fleet of more than 6,000 vessels landed an assault force of 156,000 men on five beaches codenamed, from west to east, Utah and Omaha (American), Gold (British), Juno (Canadian) and Sword (British). Some 14,500 Canadians landed on Juno Beach by the end of the day. It is also a significant milestone in the history of the Juno Beach Centre as it celebrates its 15th anniversary. 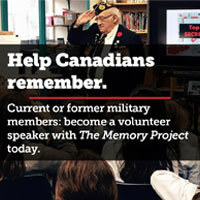 The centre opened its doors on June 6, 2003, and has since provided thousands of visitors with a better understanding of the contributions Canada made to the Second World War. Poppy crosses at Arromanches-les-Bains, where the British installed a temporary harbour after D-Day. “Today we remember that 74 years ago, the Canadians and the British stood side by side in the name of peace and freedom, as they did 15 years ago at the centre’s opening, and as they do today,” says Don Cooper, president of the Juno Beach Centre Association. Preparations are already well underway for June 2019, the landmark anniversary of the Normandy invasion. 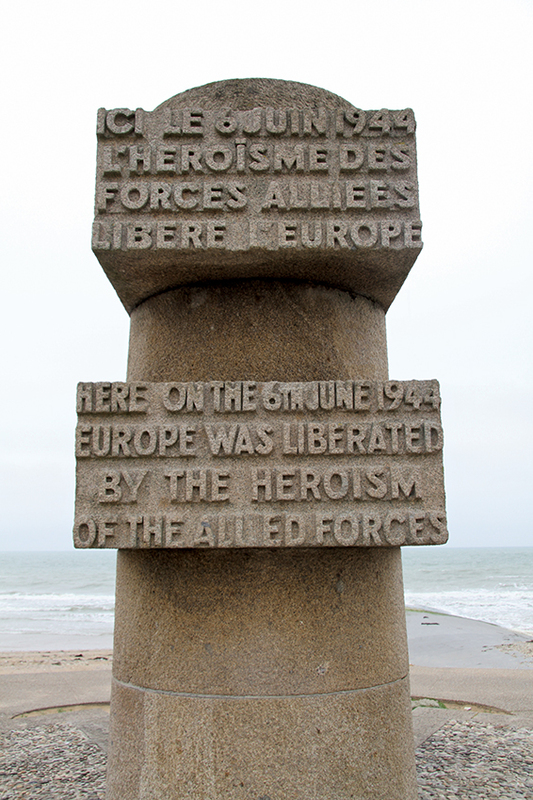 My tour of the Normandy beaches is co-ordinated by Liberation Route Europe, which is embarking on an international campaign called “Europe Remembers” to inspire people to journey along the same route the Allies took through western Europe in 1944 and 1945. The Juno Beach Centre plans to unveil a redesigned and modernized tour of the museum in February 2019, with interactive experiences for families and school groups to explore. 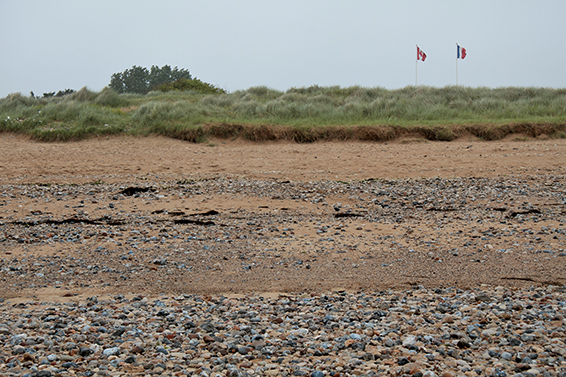 Flags of Canada and France fly over Juno Beach. As it was 74 years ago to the day, the Normandy coast today is laden with thick grey clouds, rain and stormy seas. But in almost every corner of every town I visit, American, British, French and Canadian flags are flying. Military re-enactors and history enthusiasts parade down cobblestone streets. Everyone is here to remember and pay tribute. Rain will not dampen their spirits for these few days in June. Our tour begins at the Utah Beach D-Day Museum—built on the very beach where the first American troops landed—and the quiet, quaint town of Sainte-Mère-Église, about 15 kilometres inland. The 82nd Airborne Division and the 101st Airborne Division were given the mission of establishing a bridgehead in this sector, to back up the American troops on Utah Beach. Their early morning landings resulted in heavy casualties, as fires illuminating the sky allowed the Germans to target the paratroopers. 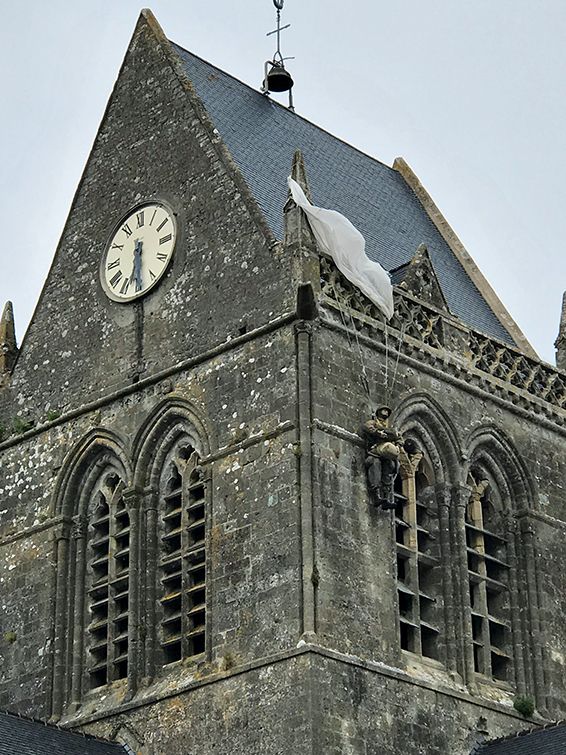 Private John Steele’s parachute caught on a pinnacle of the church tower that day, and the injured paratrooper hung there, pretending to be dead, for two hours before being taken prisoner. Today, a parachute with an effigy of Steele in his uniform hangs permanently from the steeple in tribute. Inside, beautiful stained-glass windows depict the D-Day parachutists. The church at Sainte-Mère-Église honours American paratrooper John Steele, whose chute caught on the tower on D-Day. 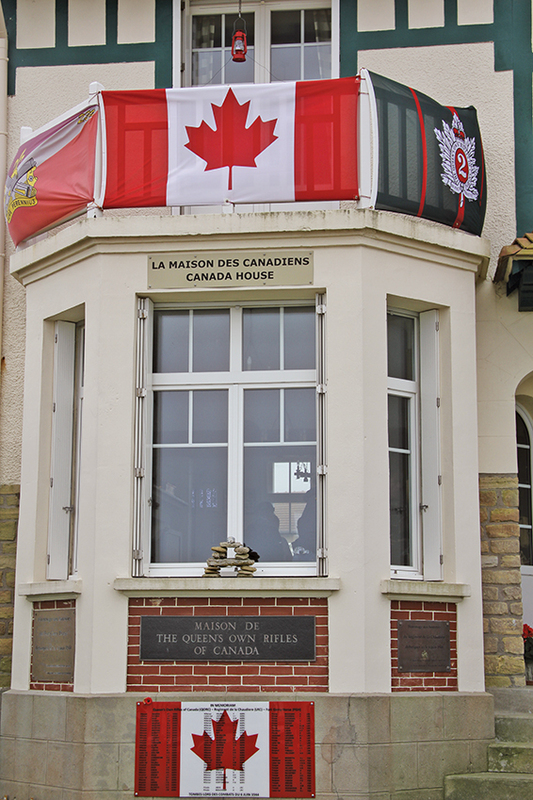 La Maison des Canadiens in Bernières-sur-Mer was occupied by a German officer until the Queen’s Own Rifles liberated it on D-Day. Titled “Remembrance and Renewal,” a bronze sculpture by Canadian artist Colin Gibson is the centrepiece of the Juno Beach Centre courtyard. 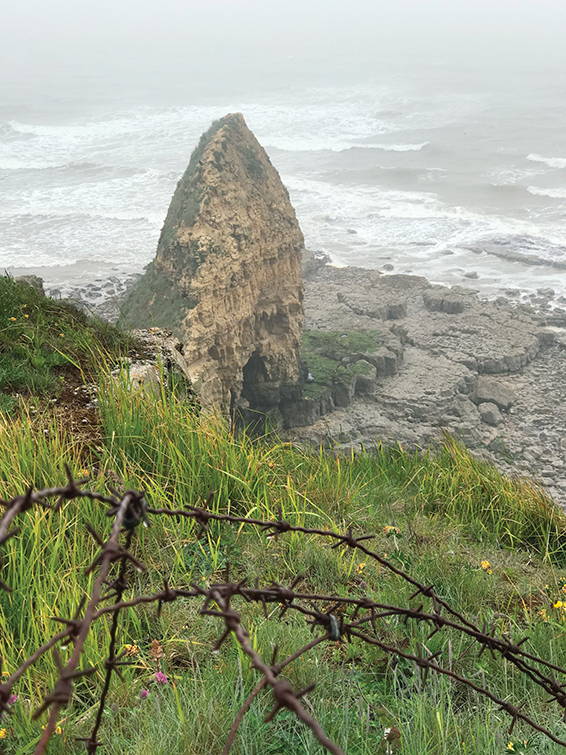 Down the coast, we explore Pointe du Hoc, located on a 30-metre cliff overlooking the English Channel between Omaha and Utah beaches. Heavily fortified by the Germans, this was the highest point taken in the Normandy landings. The defences faced inland, the enemy assuming the cliffs would deter a sea invasion here. Amazingly, the U.S. Army’s Ranger Assault Group scaled the cliffs and took the point on D-Day morning. A short drive takes us to the sombre German war cemetery of La Cambe and the impressive Normandy American Cemetery and Memorial. The American cemetery contains nearly 10,000 white marble grave markers, perfectly aligned and pristine, resting on a bluff overlooking Omaha Beach. In contrast, La Cambe’s crosses are made from grey schist and do not mark individual graves. Instead, burial locations for more than 21,000 German soldiers who lost their lives in Normandy are marked by plaques on the ground. This mournful site is a reminder of the suffering war brings to all sides. An adjoining peace garden features 1,200 maple trees. It is very different compared to American and Commonwealth cemeteries, and it left me with a sense of mindfulness and reflection. 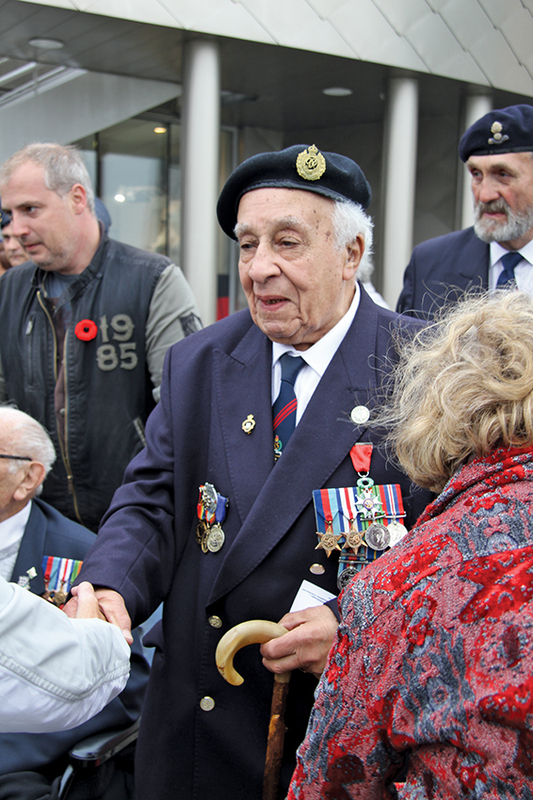 D-Day veteran Patrick Moore was a guest of honour at this year’s ceremony at the Juno Beach Centre. 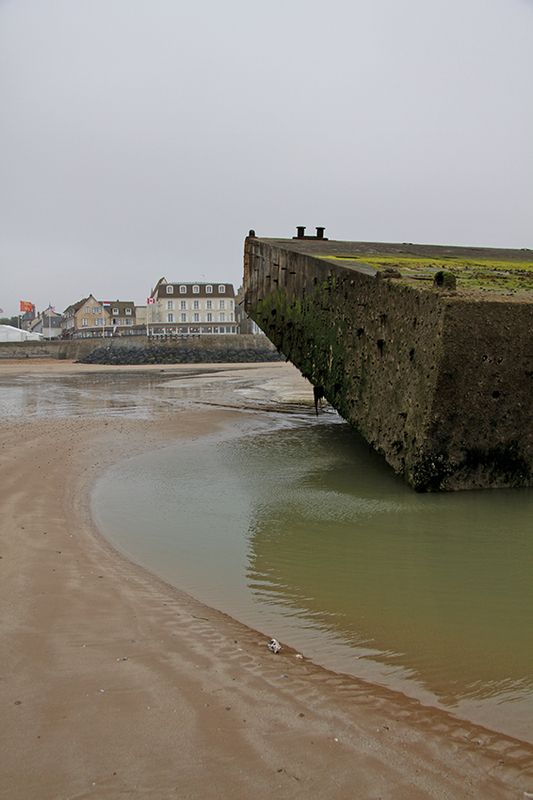 Low tide exposes structures (above) from the artificial port at Arromanches-les-Bains. The morning of June 6 brings more cloudy skies and wet weather, but as we arrive at Arromanches-les-Bains and begin to walk the beach, the rain subsides, allowing us to explore and take in the town. An artificial harbour was built here by the British to supply materiel and fuel to Allied troops in France; at low tide, huge concrete structures remain visible on the shore and farther out on the sea bottom. Following the memorable ceremony at the Juno Beach Centre, we travel to La Maison des Canadiens overlooking Juno Beach. Canadian soldiers liberated this family home that had been occupied by a German officer, one of the first buildings on the Normandy coast taken by the Allies on D-Day. The owners, the extended family of the late Hervé Hoffer, warmly welcome us in, and our small group is amazed at the collection of tributes, regimental insignia and wartime artifacts on display. Visitors, especially if they are Canadian, are welcomed and treated like family. By the end of this week of tributes to those who sacrificed it all 74 years ago, I feel proudly at home, even though—like those who came to fight—I’m from an ocean away.